A great British metal amp that will find many friends and admirers on both sides of the Atlantic. Superb, UK build. Not just a big Dark Terror. Quiet noise floor, despite the gain on offer. Surprisingly flexible. Over the last few years, Orange's ethos has shifted from funky retro classic rock and Britpop backline to increasingly becoming the metal amp of choice for many top players. Cue, therefore, the arrival of a new 'Dark' amplifier that uprates the highly successful Dark Terror to serious stage levels. The Dual Dark debuted at this year's winter NAMM show, and it comes in both 50- and 100-watt versions. Made in the UK to Orange's typically high standards, the Dual Dark is a heavyweight amp in every sense of the word. A tough ply sleeve wrapped in black vinyl surrounds a heavy-duty steel chassis, with a traditional full-height steel front panel, and grab rails on the front and top of the metalwork. Combined with massive mains and output transformers, be prepared: it all adds up to a serious head that outweighs many 1x12 combos. Inside the steel chassis, most of the electronics are contained on one very large printed circuit board that holds the front panel controls and the valve sockets, along with all the preamp and power supply components. "The multiple gain stages in both channels have the potential for massive overdrive and distortion effects"
The Dual Dark amp is a proper two-channel design, with no less than four stages of gain in each preamp. Channel B is the familiar Dark Terror layout, with gain volume and a single 'shape' tone control that emphasises bass and treble in one direction and midrange in the other. Channel A features gain, volume and three-knob EQ, with a distinctly different voice that's aimed at rock and metal users. The multiple gain stages in both channels have the potential for massive overdrive and distortion effects. On some amps, this can also be a source of noise and hum. However, both the heads we tested were remarkably quiet, thanks to Orange's typically high-quality components and superior board layout. According to technical director Adrian Emsley, noise from a nearby radio tower caused several headaches during the design process, leading him to try to remove noise that wasn't there in the first place. There's also a footswitchable attenuator with a front panel level control, and a valve-buffered series effects loop. This effectively acts as a post-master volume control, turning down the amp after the master volume. Used in combination with the half- and quarter-power options on the 100-watt variant, this feature adds significant power and tone options, providing a third footswitchable volume level for rhythm/solo use, as well as allowing the user to explore power amp drive effects. The overall impression is one of power and purpose - make no mistake, these amps are not for the faint of heart. The Dual Dark comes in 50- and 100-watt versions, but sonically they're practically identical: the only difference being an extra switch on the 100-watt amp that allows you to turn off one pair of valves. The big amp obviously has more headroom and power, but the clarity of the 50-watt version is so good that when we tried them alongside each other, we really didn't hear much difference. Channel B is the Dark Terror, albeit with a big dose of extra headroom. The shape EQ control on this channel makes dialling in any guitar a piece of cake - turn it to the left to emphasise treble and bass, or turn it to the right to bring mids to the front. Channel A, however, is very different, with a new and very powerful EQ section - it's extremely fat, with a strong midrange, yet none of the peaky nasal quality you often get from amps with strong mids. A rounded treble and extended bass make this channel perfect for detuned or seven-string players. Both channels have four gain stages, which adds up to huge overdrive and distortion, yet they're also very responsive, making it easy to clean up the sounds just by turning down the guitar's volume control. "We felt the Dual Dark really came alive with a good throaty humbucker - the EMG 81 sounded particularly good"
Channel B, when dialled in, gets the percussive fast attack of most modern metal styles, while Channel A's response is a little tighter, and in many ways easier to play. The half-power switches make it easier to use the amp in smaller venues, while the footswitchable panel attenuator control enables you to dial the amp output right down to zero if needed, which is ideal if you want to use either head at whisper levels, or fine- tune the power amp response for rhythm and solo work. We tried the Dual Darks with a variety of different instruments, including an old Stratocaster fitted with Duncan Alnico Pro pickups, a PAF-equipped Les Paul Standard and a 1980s Jackson Soloist loaded with EMG active pickups. While all the guitars sounded great, we felt the Dual Dark really came alive with a good throaty humbucker - the EMG 81 sounded particularly good, with great clarity and string to string balance, combining just the right amount of bite with a powerful bass that should easily extend down to a low B for seven-string instruments. 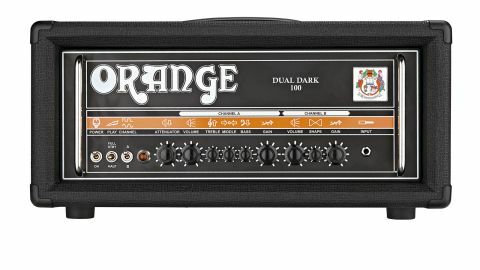 These new Orange Dual Darks are serious amps for serious players and are aimed, primarily, at modern metal fans. But there's a lot of tonal depth and range behind the deceptively simple front panel, making them actually quite good for crossing over into different styles, although by design they're not as well suited for classic rock and blues as some of the other amps in Orange's catalogue. However, for creating walls of overdriven filth they're pretty unbeatable. The higher-than-average retail price is a result of these amps being made in the UK with the kind of build quality and attention to detail you'd expect from Orange. So while they are a little on the pricey side, we think they're still pretty good value for money. If you take your metal art seriously, you have to try them.